2019 has set off to a great start for us here at WFP! We’ve been shortlisted for the Safety & Health Excellence Awards 2019 for the fire detection and voice alarm upgrade at the £134m, nine-storey Central London office building, Condor House. Following a gruelling seven months of intricate work, involving the replacement and installation of more than 900 smoke detectors, 600 interfaces and more than 1,000 speakers, the project finally came to a close at the end of January 2019. And what better icing on the cake than to be a finalist for ‘Health & Safety Project of the Year’! 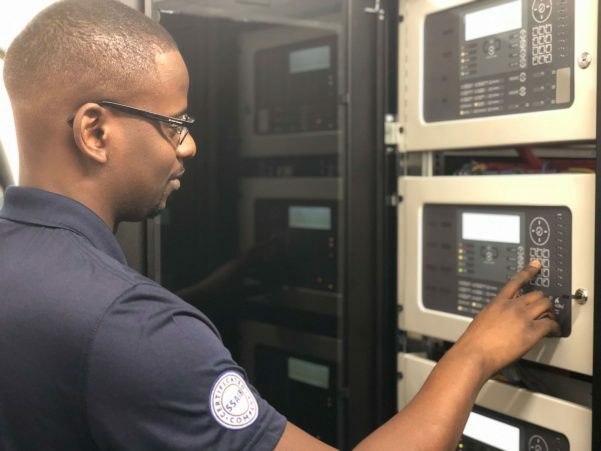 Hats off to WFP’s Contracts Manager, Scott Wright, who project managed the upgrade to an Advanced fire alarm system, and spent months preparing, building and programming prior to the physical fitting. Sat just across St Paul’s Cathedral, Condor House comprises 110,000 sq. ft. of office space, accommodating some of the big names in finance, investment and law. With an occupancy of approximately 800 people, the real challenge was carrying out an elaborate, invasive takeover without actually being invasive and disruptive to the building’s day-to-day operations. And, suffice to say, most of the tenants didn’t even know the job was taking place! What makes this project so impressive is that the old system (a Simplex system) was fully functional throughout the upgrade; i.e. at no point was the building left unprotected from fire detection. Of course, with up to 800 people coming and going throughout the building, we had a duty to ensure the protection of the building at all times during the upgrade. In essence, we replace a live system with a live system! This often meant that floors and designated areas had to be completed within a single night. At certain stages, half of one floor would be operating under the old system, whilst the other half would be operating under the new system. Another impressive aspect of the job was the level of intricacy with the cause-and-effect programming. Cause-and-effect programming to you and I is whereby, for instance, a detector is triggered in a particular room and this would automatically trigger the opening of an AOV smoke vent to control the ventilation of the smoke in the event of a fire (or another fire protection device). Clever, eh? Now imagine if you had to implement a variety of different cause-and-effects, and test them, all within a limited time frame and in a building of this scale! Read the full case study here for more information!